By now, it should be no surprise that consuming sugary drinks is considered to be unhealthy. This includes soda, energy drinks, as well as fruit drinks. 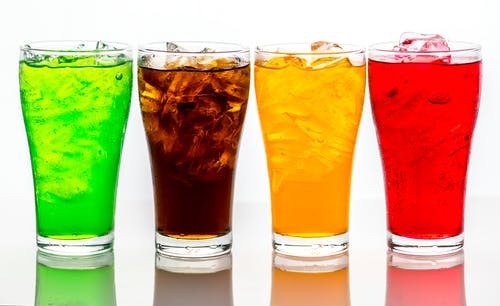 Gulping down these types of beverages has been associated with weight gain and type 2 diabetes in the past.1 However, this doesn’t seem to stop people from continually ingesting these products on a daily basis. New research has now linked sugary drinks to premature death.2 Hopefully, this information grabs the attention of consumers next time they reach for one of these beverages. Let’s take a look at the health implications of these products, what is being done to reduce the public’s consumption, and some healthy alternatives to curb the sugary drink habit. The scientific evidence demonstrates the need for change amongst Americans to reduce their sugar intake to improve their overall health and mortality. This seems like a huge undertaking to convince the public to alter their unhealthy habits. However, there are effective methods to consider when trying to implement change. New York City is an example of how to reduce sugar-sweetened beverage consumption. In fact, the city was able to decrease sugary drink ingestion by 35% by way of marketing, institutional changes, and public policy.1 Marketing campaigns displaying powerful images of the actual amount of sugar in these types of beverages were plastered all over subways and bus stations. The messages made visual connections between the drinks themselves and the effects on the body in a way that was easy to understand. In city institutions, like schools, hospitals, and shelters, rules regarding the types and amount of sugary drinks that were served or available in vending machines were implemented.1 Notably, a major component of these regulations was that 75% of available beverages had to be under 25 calories per serving.1 Lastly, New York City policy has attempted to reduce the portion size, apply taxes to, and restrict government assistance to purchasing sugary drinks. While most of these implementations were either denied or overturned, the conversation received a lot of media attention and call for policy changes.1 The reduction in consumption of these beverages in New York City demonstrates that it is possible to reshape this unhealthy habit and that it requires a lot of work from public health organizations. The dependency on sugary drinks in this country is a real issue, causing disease and premature death. Not only is it a strain on the public’s health, but also the economy.2 While government imposing restrictions of your personal choices might feel un-American, however, personal adaptations can help break the addiction. Simple swaps can be made every day to replace sugar-sweetened beverages. Below is a list of healthy alternatives, besides water, to quench a thirst. Looking for more tips and tricks like this to keep you family happy and healthy? Check out the Fill Your Plate Blog. Looking for some new recipes to try out? Check out the Recipe Section of our website. How about some fresh produce that the whole family will enjoy? Check out the local Farmers Markets near you. Kansagra, S. M., Kennelly, M. O., Nonas, C. A., Curtis, C. J., Van Wye, G., Goodman, A., & Farley, T. A. (2015). Reducing sugary drink consumption: New York City’s approach. American journal of public health, 105(4), e61-4. Malik, V.S., Li, Y., Pan, A., Koning, L. D., Koning, L.D., Schernhammer, E., Willet, W. C., and Hu, F. B. (2019). Long-term consumption of sugar-sweetened and artificially sweetened beverages and risk of mortality in US adults. Circulation, 139. This entry was posted in Diet Tips, Fill Your Plate, Food, Food Safety, Health Tips, Healthy Eating, In the Kitchen, Kids and tagged Family, Healthy Alternatives, Healthy Eating, Healthy Living, Soda, Sugar. Bookmark the permalink.